men and women at competitive prices. It can therefore be used to improve the thickness and tone of ageing skin, improving the appearance of fine wrinkles, areas of altered pigmentation and large pores. It is of particular value in the treatment of acne scarring, chicken pox scars and post-surgical scars. Derma Pen treatment can also be used to improve the appearance of stretch marks. The Derma Pen is a single roller device which consists of a rotating wheel studded with tiny 1.5 mm long needles. These needles penetrate the skin, stimulating the production of collagen and elastin, which in turn cause the skin to mount an injury response. This procedure utilises the collagen and elastin to thicken the skin, repair scars and smooth out any fine lines and wrinkles. This stimulus also causes growth of new capillaries which improves blood supply to the skin. The area to be treated is numbed with local anaesthetic and cleaned with antiseptic solution. The Derma Pen is lightly rolled over the treatment area until the end points of pin-point bleeding, redness and mild swelling are reached. Typically a treatment session will last 15 – 30 minutes. After treatment the area is cleansed and a soothing cream and sun block applied. Is the Derma Pen treatment painful? No the treatment is not painful, but it can be mildly uncomfortable. The skin is numbed before treatment either with local anaesthetic cream or nerve block. After the treatment you may feel as if you have slight sunburn for the next 12-24 hours. How many treatment will I need in order to see beneficial results? For some people a single treatment session is all that is needed to significantly improve the texture and appearance of their skin. Most people will require up to 4 treatment sessions, typically at six week intervals. 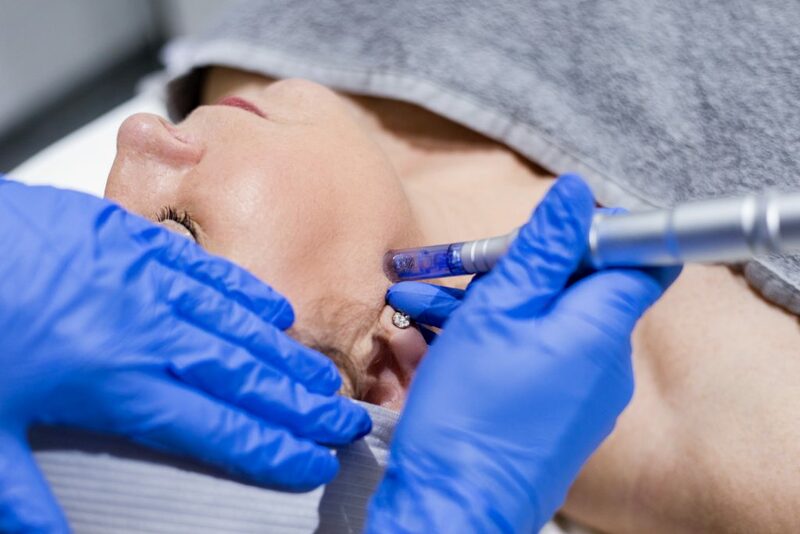 For patients with severe acne scarring, up to five Derma Pen treatments will be needed. Improvement in skin texture and tone may appear one to three weeks after the initial treatment. Are there any risks or side effects with the Derma Pen treatment? The treatment is remarkably safe if you are treated by a trained beautician. Derma Pen is frequently used for treating hair loss in both men and women. The simple hand held roller is rolled along the scalp to stimulate increased blood flow to the surface of the head. Thinning hair can be thickened, and the loss of hair from the scalp is reduced. Derma Pen uses traditional oriental acupuncture techniques to stimulate hair growth just as it enhances the skins natural healing abilities. It promotes increased blood flow to carry nutrients to the hair follicles. In trials patients have experienced an increase in hair growth and an average 80% reduction in hair loss. The hair restoration and regrowth process can help have with thinning hair, balding, bald spots and receding hairlines. Click here to book a Derma Pen consultation or an appointment online. Please note there will be a charge of £25 for all consultations. If you decide to book your treatment after the initial consultation this charge will be waived. © 2018 www.stjamesbeauty.co.uk. All Right Reserved.